Day 11: May 8, 2015. This morning we learned that it was too windy to land on Delos. We would have to use tenders and it was too dangerous to transfer from our ship to the tenders in the high winds. The ship has stabilizers so were did not feel any of the bad effects of the wind. 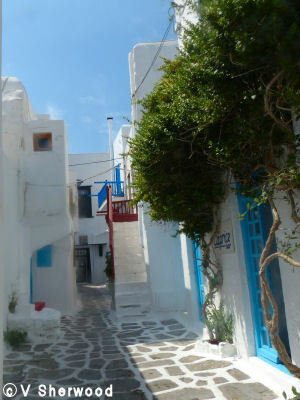 It was disappointing to miss seeing Delos but it had been arranged that the ship would dock the whole day in Mykonos and there would be shuttle buses to Mykonos Town so we could spend as much time as we wanted exploring and shopping. The organization on this trip is really excellent. There were no archaeological sites to visit so shopping was the order of the day. We had to buy a present for our neighbour who was babysitting our plants. I was also on the lookout for earrings to match a silver bracelet I had, so off we went. The town was very picturesque too. And we kept a lookout for the famous Petros the pelican which frequents the restaurants of Little Venice. 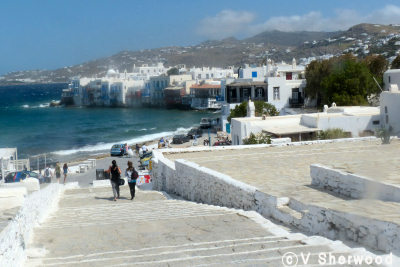 The shuttle bus dropped us at the east end of town and we walked along the shore to downtown Mykonos. We were struck by this church with a red roof; most had white or blue roofs so this one really stood out. 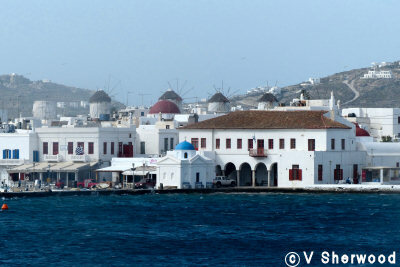 Downtown Mykonos with a pretty little church right on the harbour and the famous windmills above the town. 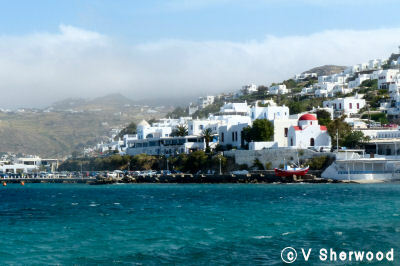 The church is Agios Nikolakis or St. Nicolaus, the patron saint of sailors and fishermen. The church was originally on a small island which was built into the harbour. 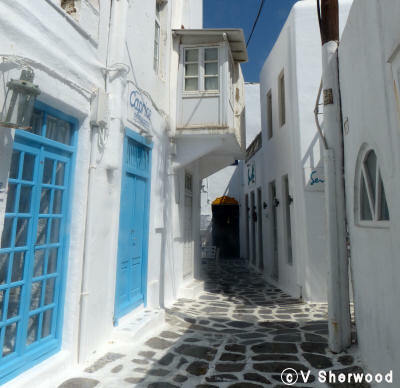 The streets of Mykonos are very narrow - pedestrians only. There is no way a car or ambulance or fire engine could drive through here..
Often the buildings are a shop on the main floor and the family lives above. We were very successful shopping. I found earrings that exactly matched my bracelet and we bought our neighbour a lovely cashmere and silk scarf. A bit of haggling and we got two for the price of one, so I got one too. I love shopping in Greece. At the west end of town, the buildings are right on the water's edge. It is called Little Venice. Many of them are restaurants with the entrance on the street and a terrace or balcony at the back with a gorgeous sea view. We looked into several of the restuarants, hoping to catch a glimpse of Petros the Pelican but no luck. However, some fellow passengers did see him and shared a photo with us. 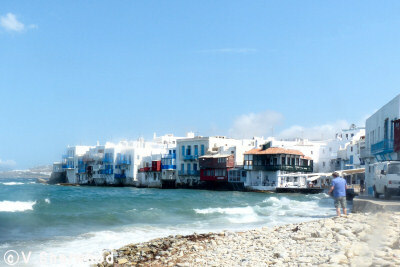 We were on our way to see the windmills but stopped to look back and down on Little Venice. 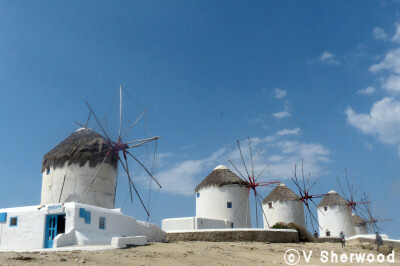 To get the best of the wind off the sea, the windmills are built on a ridge above the town. The only way to get to them is up. 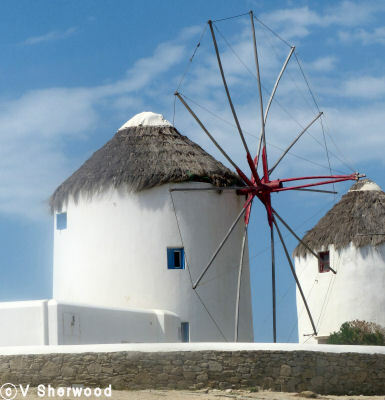 The famous windmills of Mykonos Town. Most were built by the Venetians in the 16th century to grind wheat into flour. One of the windmills has been made into a museum. The windmills all face north to catch the prevailing winds. When grain was to be ground, sails were mounted on the arms. 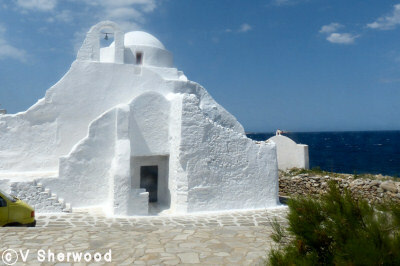 Panagia Paraportiani church, Our Lady of the Side Entrance, is situated at the side gateway into the castle. It was started in 1425 but not completed until 200 years later. It is actually 5 churches, 4 acting as the base for the fifth built on top of them. The 4 churches are dedicated to Saint Eustathios, Saint Sozon, Saints Anargyroi and Saint Anastasia. 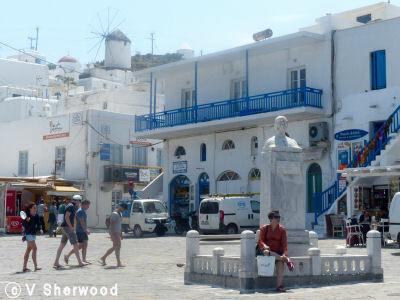 On our way back to the bus, we walked through the main square of the town where there is a monument to Mando, a rich lady living on Mykonos. When the war of independence from the Ottoman Empire broke out in 1821, she gave all her money to support the Greek cause. Greece won their independence but Mando died a pauper.